The Kyrgyz opposition says it has formed an interim government after seizing power in the capital, Bishkek. This follows violent protests by anti-government demonstrators that took the lives of more than 70 protesters. On Wednesday night the number of dead in the riots reached 75 and about 500 more people have been hospitalized with injuries, according to the Kyrgyz Health Ministry data. The headquarters report said most of the fatalities occurred in Bishkek, the nation’s capital, and the cause of death in most cases were gunshot wounds. Meanwhile, the opposition claims 100 people have been killed. Dissatisfied with the country’s leadership, the protestors are calling for a major political reshuffle, including the resignation of the country’s leader, Kurmanbek Bakiyev. “The main demand is the resignation of President Bakiyev, who is accused of nepotism, raising energy prices, and illegally selling a hydro-electric station. People are demanding an early election,” Shamil Murat, a Kyrgyz opposition activist from Talas, told RT. On Wednesday, Kyrgyz president Kurmanbek Bakiyev declared a state of emergency in the capital and several regions of Kyrgyzstan. Police have used tear gas and concussion grenades in an effort to disperse thousands of people gathered in front of the government building in Bishkek. The demonstrators managed to seize the government building, the parliament building and the building of the state television channel KTR. “We can confirm that the national TV and radio broadcasting corporation was captured by the opposition,” an eyewitness, Bektur Iskender, editor-in-chief of www.kloop.kg, told RT. Similar events are taking place in other regions of the country. Fergana.ru repots that in the regional center of Talas, experiencing clashes for the second day, chaos now reigns. The protesters have seized the local governor, deputy prime minister and the interior minister. News agencies report that several local government buildings have also been seized. Earlier, the KABAR news agency reported that protesters had seized the building of National Security Service in Bishkek and freed those detained. Reportedly, most of the opposition leaders, detained earlier during protests in Talas, have been released. The Prosecutor-General’s Office in the capital has been reportedly burned down, as well as the three houses belonging to the Kyrgyz president’s family. A group of marauders began to rob those houses before they were set on fire. There are reports that the local art museum has also been robbed. Late on Wednesday evening the Kyrgyz opposition announced they had formed a provisional government headed by former foreign minister Roza Otunbayeva. Further, the previous government has tendered its resignation in full, a representative of the opposition told RIA Novosti news agency. “The opposition controls the power in the republic. The president’s whereabouts are unknown,” Otunbayeva told the press. She also said the most important task for the provisionary government is to maintain stability, protect human lives and prevent looting. "I think we simply cannot remain indifferent. As citizens of this country we cannot stand and watch how it's being robbed – boldly and dishonestly. You might say it's not surprising and is typical of all former Soviet republics. 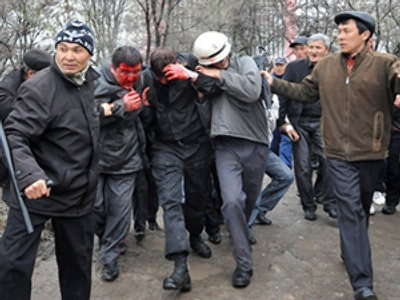 But here, in Kyrgyzstan, they are doing it in a rude, savage and barbaric way. They are doing it with a high hand, and we simply cannot tolerate it any longer," Otunbaeva added. “Preliminary consultations between the official authorities and opposition leaders on halting the clashes have started,” Elmurza Satybaldiyev, the state advisor on defense and security, told Kyrgyz news agency 24, as cited by RIA Novosti. Omurbek Tekebayev, one of the leaders of the Kyrgyz opposition party 'Ata-Maken', explained to RT what their next moves are likely to be. “The disorder in the capital is getting worse. The Interior Ministry is not under the control of the opposition's temporary government, nor the old one, and it isn’t doing anything,” according to Tekebayev. “This situation will soon be resolved and the opposition government will have its first session, with all members present,” Tekebayev said. Omurbek Tekebayev has also said the roots of the unrest lie in the US role in the country. "Today, I blame the Americans for their double standards – when they see all this and close their eyes to it. They criticize other nations while here they support the regime. And we believe that it could be due to the fact that Bakiyev is letting them fully restore the American military base and agrees to give them more land." There are conflicting reports as to the whereabouts of Kurmanbek Bakiyev. According to KABAR news agency, Bakiyev has moved to Osh – the second largest city in Kyrgyzstan located in the south of the country – and the defense minister has arrived there with him. Erica Marat, a researcher at the Central Asia-Caucasus Institute in Washington DC, told RT that the alleged escape of Kyrgyz President Bakiyev does not automatically mean the opposition has been victorious. “I think at this point we can’t say if it was a revolution or not. 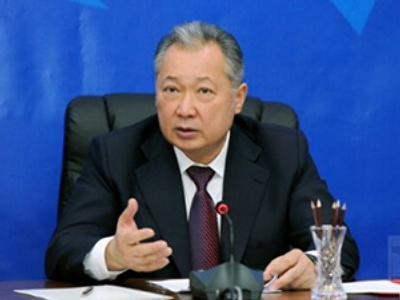 We still haven’t heard what Bakiyev’s next steps are going to be. Until we hear from the president, we can’t claim victory for the opposition or from any other party. The president can still use force to protect his regime through his proxies inside Kyrgyzstan, and this can still lead to more bloodshed,” Marat said. “That means if Bakiev’s regime pretend to be more secular one, the next regime would pretend to be more Muslim,” he added. According to some troubling reports, the supporters of Kurmanbek Bakiyev are now receiving arms and there is speculation that the opposition forces in Bishkek are giving out arms to their supporters, too. The Kyrgyz Border Service has strengthened security along the country’s borders. Meanwhile, media reports say the Kyrgyz police have come over to the opposition. Gennady Chufrin from the World Economy Institute says Kyrgyz President may have no choice but to give up power. The incumbent president of Kyrgyzstan, came to power in 2005 as a result of the so-called Tulip Revolution. "These events only resemble the 2005 Tulip Revolution in external signs and causes.The reasons for the current disturbances are significant corruption, the economic troubles of the Kyrgyz people, and because President Bakiyev’s clan occupies all the leading posts in the country. He is not Akayev, his predecessor, and he won't give up his power as easily. Blood is going to be spilled,” Professor Sergey Lusyanin, from the Russian Academy of Sciences, told RT. Kyrgyzstan, or the Kyrgyz Republic, is a country in Central Asia with a population of about 5,5 million people. The capital is Bishkek. A former Soviet Republic, it gained independence in 1991. The Tulip Revolution refers to the overthrow of the Republic’s President, Askar Akayev, in 2005. The upheaval was caused by the popular dissatisfaction with the regime, which was thought to be corrupt and authoritarian. The term Tulip was coined by Akayev himself when he used the word in a speech, saying no colour revolution should take place in Kyrgyzstan. Talas is a small town in northwestern Kyrgyzstan with a population of about 30,000 people. An expert on Central Asia, Asher CJ Pirt, says the running of the 2009 presidential election is to blame for the discontent. “The elections were, in many eyes, stolen by the authorities. There were a lot of irregularities and this is a great concern to the local population. Bakiyev didn’t really seem to allow the proper electoral process to go on. And of course he doesn’t have the legitimacy that he needs to run the country,” he said. Lilit Gevorgyan, a political analyst from IHS Global Insight, a leading financial and market research company, believes the protests were triggered by the court decision to ban opposition newspapers as well as TV outlets. “I think that was the last straw that prompted the opposition to take its protest onto the streets, but the undoing of Bakiyev’s government had been coming for many months now. I would say that his decision in October to centralize, even further, his power, putting most important ministries under his control, started the process,” she said. Among the causes for the unrest are the alleged attempts on the part of the ruling party to prevent opposition meetings across the country scheduled for April 7. The steps taken included the detention of opposition leaders. The demonstration began in Talas on Tuesday. Earlier, opposition leaders has made some demands to the authorities. In particular, they demanded changes to the country’s constitution and the resignation of some high-ranking officials. Otherwise the opposition leaders promised to organize mass clashes on the next day, April 7. The cause of the popular unrest was the detention of one of the opposition activists on Tuesday, April 6. About 1,000 people gathered at the local interior department, demanding Bolot Sherniyazov’s freedom. The opposition claimed that, after the demand, he was released under opposition pressure. But the local interior department professed that Sherniyazov had not been detained, but merely invited to the officials to discuss impermissibility of certain unauthorized actions. Since that time, there have been some more reports of the detention of opposition leaders, according to human rights organizations. On Wednesday, April 7, popular unrest spread to Bishkek. Opposition leaders gathered by the headquarters of the Kyrgyz opposition Social-Democratic party, leading to clashes with police. Kyrgyz Prime Minister Daniyar Usenov has called current events in the country a crime against the state. According to his information, during the clashes in Talas, 85 policemen were wounded, including 19 who were hospitalized, with five of them in critical condition. The current unrest was planned, claims the Kyrgyz prime minister. “Events in Talas were organized in advance and aimed at taking power,” he said. Similar disturbances were also planned in other regions of the country, Daniyar Usenov added. Meanwhile, Edil Baisalov, the opposition member, told RT that the authorities are abusing their power to crack down on the opposition. “Today they literally turned off access to the Internet,” Edil said. “They turned off the leading blogs”. “They understand that this is the final battle and they are using all their means”, Baisalov concluded.